Having a baby is one of the coolest things in the world. Having your house taken over by everything baby is not one of the coolest things in the world. Ever since we had June it has been so hard for me to keep track of everything. There are diapers in the master bathroom, headbands in the washing room, little baby spoons popping up somehow in the car. Keeping track of everything baby make me feel like someone has pulled my head off, attached it to a pinata, and let hundreds of screaming toddlers take a swing at it. Perhaps what it the hardest is keeping track of diapers and wipes. Diapers, those elusive little suckers, are everywhere when you don't need them and nowhere when you do need them. The only thing more frustrating than finding diapers in your grading bag, your kitchen cupboard and your lingerie drawer is not being able to find a single diaper when you need it most. My original idea was to only keep diapers and wipes in June's closet and in the diaper bag. They were never to leave those two spots. That's a lot harder than it sounds. Because sometimes I'm not in June's room, I'm downstairs making dinner. Having to run up to get all the diaper gear and then take it all back up to put it away was seriously wearing on me. Last month, I finally got smart. After reading this article in the Healthy Living Made Simple magazine about organizing beauty care items, I decided what I really needed to do was organize my baby care items. Instead of having one place to keep my diapers, I would have three places- all the main areas of the house. 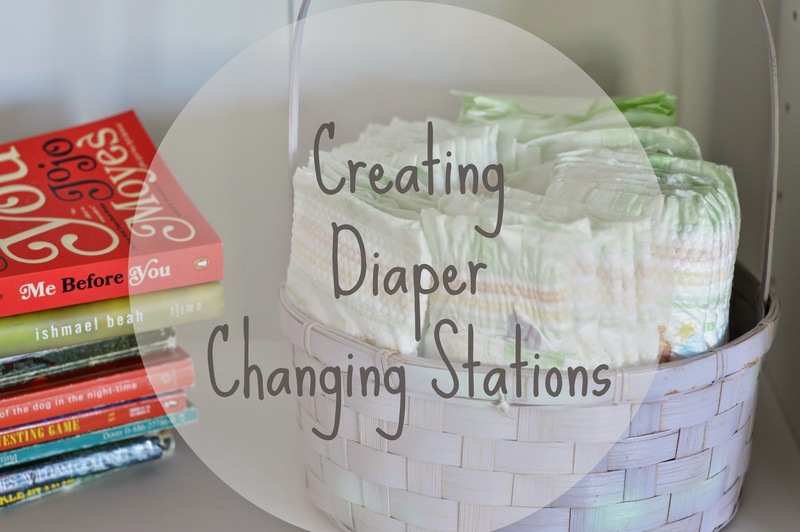 Diapers would no longer be kept in drawers or cupboards, but out in the open, in baskets. Diapers and wipes needed to be easily accessible and easily visible so that I could finally quit answering Greg's ever constant question, "WHERE ARE THE DIAPERS!?!?" First stop in my genius plan was to hit up Sam's Club. Three separate stations around the house were going to require a lot of diapers and a lot of wipes. There's no place like Sam's Club to stock up on massive amounts of baby stuff. (And they always have everything I need. Nothing is more frustrating than having to make several stops for your baby needs. Sam's Club has got it all.) 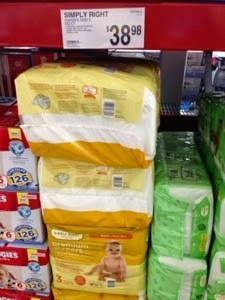 Also the idea of not having to buy a new pack of diapers in a week was very alluring to me- bulk buying for the win! The second step was to determine the best places for said "diaper stations." We definitely needed one in June's room, by the changing pad. One on the main living floor was a must, and lastly, one in Greg's and my room seemed crucial to maintaining our sanity. I got to work on my diaper stations. I found baskets in my downstairs storage. Each basket was loaded up with as many diapers as it would hold and a big pack of wipes. Easy as pie. Having these bad boys all around our home has seriously made changing diapers SO much easier. (Disclaimer: every diaper station needs a diaper waste basket right next to it- that makes life even easier!) It is so nice to have a little diaper station so close at hand that I never have to go far to get my little girl cleaned up. And maybe, just maybe, I won't lose my head after all? Now it's your turn! Take a look at this Healthy Living Made Simple magazine and tell me how you are inspired to simplify and organize your life this spring.